Portable & hollow – I wanted the roller to fit in my gym bag, so 12-13 inches in length is max. The type with a hollow core (usually pvc) will let me utilize the space to store stuff. Stiffness – The type with PVC core can range from having foam that are pretty soft to very stiff. I figure I can always adjust the pressure by supporting my own weight differently, so I went with more stiffness. Reputable brands and good warranty – I’ve seen several images of users posting that the “core” of the roller breaks. Reputable companies will probably replace it (since I’m way under the “weight limit”) if it does break. Over the weekend, I purchased the Trigger Point Grid X (extra firm). 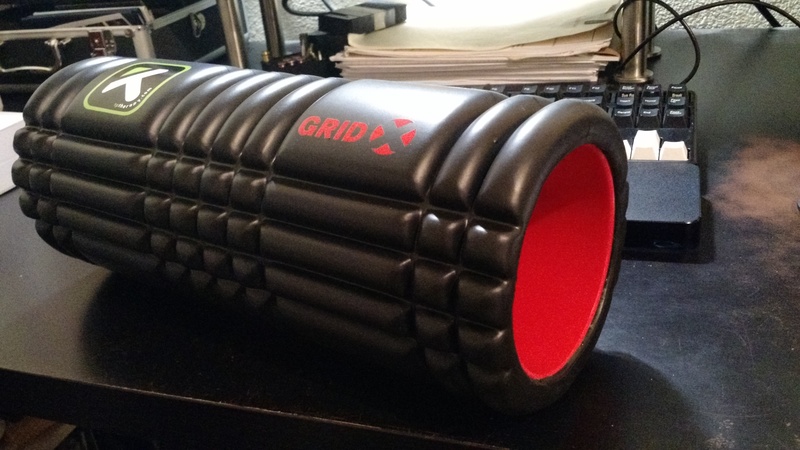 It is not the cheapest foam roller at $49. I happen to have a gift card to make the purchase less “damaging” to my wallet, but I would have probably purchased it even at its full price due to it matching all the features I was looking for. (Plus, certain stores have very good return-policy, so if this ends up not helping, I could return it). [On a typical week, I train BJJ 3-4 times a week (focusing on this since I’m new to it), Krav Maga 3 nights, Kung fu 2 nights, sparring on Saturday, and Sunday is my rest day.